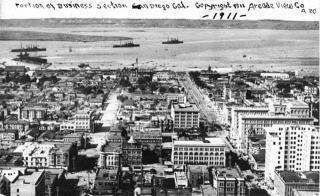 Downtown San Diego -1911. Shows the bay before it was dredged by the Navy. 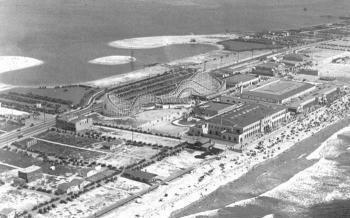 North Island & Point Loma -1920s. 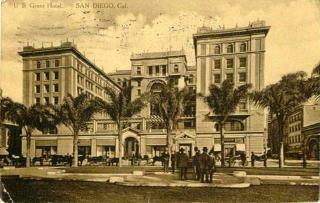 San Diego, U.S. Grant Hotel -1920s. Looking southwest over the ocean. That's the Big Dipper roller coaster, and the Plunge. Lane Field was used in use from 1936 to 1957. It had green wooden bleachers. 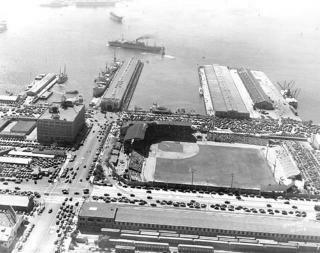 In 1958, the Padres moved to WestgatePark (now the site of Fashion Valley Mall). In 1967, they moved to Jack Murphy Stadium (now Qualcomm) and an amazing winning season in 1998 helped them get Petco Park built. 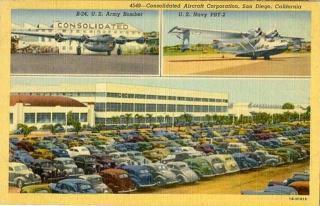 Convair - was relocated from Buffalo, NY to San Diego in 1935 At the time, seaplanes were thought to be the feature of the aircraft industry. During WWII, Consoldidated produced B-24 Bombers at a rate of one per hour. They also produced PBY (Catalina) Seaplanes. 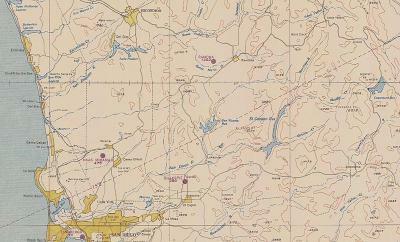 In 1953, the company became a part of General Dynamics. They produced the Atlas Intercontinental Ballistic Missle which was a key part of the early space program of the USA. 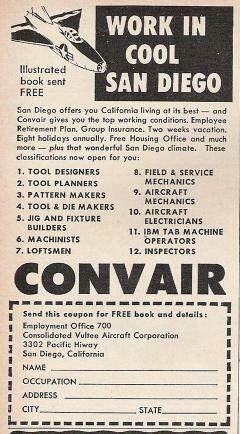 Convair was finally sold off in 1992 and later dismantled. The U.S. Grant Hotel is still there and recently underwent an extensive remolding. Across the street Horton Plaza was just a nice fountain with grass all around, where the prositutes hung out. 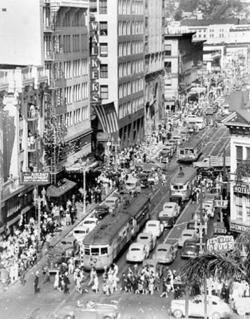 The street were replaced by a bus system in 1949. 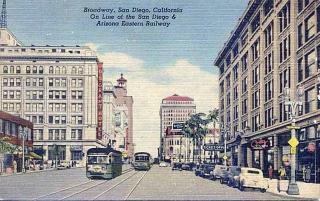 San Diego, CA -1947 No Freeways! 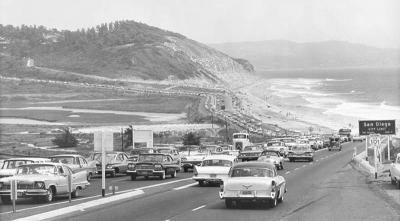 No Freeways, just Pacific Highway and Hwy 80 going East. The San Diego river emptied into Mission Bay, but now the channel goes to Ocean Beach. 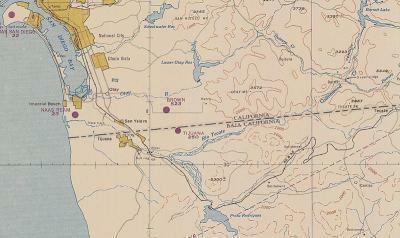 Also notice the water-filled gap between North Island and Coronado where the ferries and "Nickel Snatchers" operated! 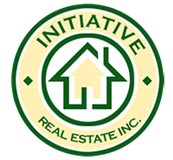 There is nothing north of Mission Valley but Linda Vista, Mission Beach, Pacific Beach and La Jolla. 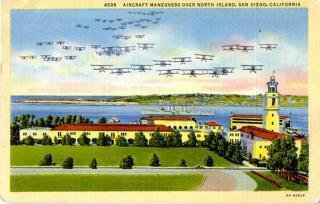 Linda Vista was a Federal goverment Housing Project, built in 1941 to house aircraft workers who were building war planes to support our European allies (before we entered WWII). 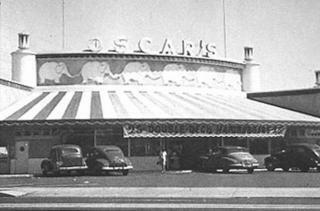 Oscar's was a true drive in with car hops on roller skates. Oscar's later became San Diego based "Jack In The Box"
There was nothing on either side of Chula Vista; today it is the second biggest city in SD county, and Tijuana now has over a million inhabitants! Look at the lines of cool-looking cars backed all the way up Torrey Pines. See, they had traffic jams then, too, but gas was 19 cents a gallon. 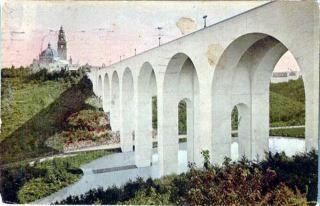 Before Interstate 5 was built, it typically took about 6 hours to travel to Los Angeles on weekends. 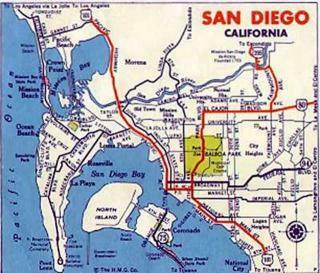 Also, there were streches of roads like "Slaughter Alley" between Oceanside and San Juan Capistrano.